Festive choirs and that lit-up, high-elevation tree are just some of the treats that'll be found at the mountain-ascending attraction. Ohhhh, ahhhh: It's a desert favorite come December. 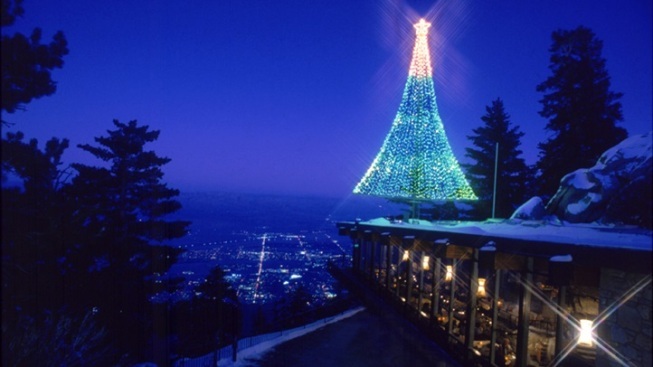 See the Palm Springs Aerial Tramway tree and hear some beautiful choirs in the coming weeks. PEAKS RESTAURANT, overlooking a glimmery swath of the Coachella Valley from its perch at 8,516 feet. And as for the calendar of events? Plan to call upon the tram on a Friday, Saturday, or Sunday from Dec. 1 through 15 to enjoy "... a different middle or high school choir perform holiday favorites at Mountain Station." The Jurupa Valley High School Singers open up the 2017 choir nights on Dec. 1 and The Lions' Pride Chamber Singers of Cathedral City High School wrap it all up in a bow on Friday, Dec. 15. There's food service, too, at the Pines Café or Lookout Lounge, so grabbing a bite up the mountain, while you listen to lovely carols, and enjoy the views, is a distinct possibility. A holiday night at the tram is an unusual experience, as seasonal happenings go, but one with some of the beloved hallmarks of the season: a choir, lights, eats, a mountain, and a fa, la, la cheer in the very crisp, bring-a-coat air.